You are looking at dual gauge track in the first photo to the left. There are actually two rails on one side of the track. Why this is, goes back to 1863 when the first horse car line was built in Columbus, Ohio. 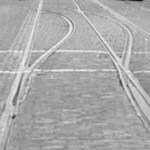 At that time the steam roads used a variety of track widths or gauge. It wasn't until later that 4' 8 1/2" became the standard gauge for any railroad that wanted to interchange freight cars in North America. When that original 1863 horsecar line was constructed on High Street the owners chose 5' 2" for their gauge. It could be as simple a reason as they had some 5' 2" gauge horsecars lined up for their new streetcar line. As other lines were built in Columbus and became part of that original streetcar company most were built to 5' 2". At least one was built at 4' 8 1/2" and another at three foot gauge. Both were changed to 5' 2" when they became part of the dominant Columbus streetcar system. When the horsecars were converted to an electric streetcar system they stayed with 5' 2". Streetcar systems didn't always have a need to interchange railroad freight cars with the steam roads so this wasn't much of an inconvenience, until the interurbans came along around 1900. Like the streetcars the interurbans also used city streets to get downtown and they were interested in exchanging freight cars with the steam roads, at least the four interurbans that traveled the four points of the compass out of Columbus. 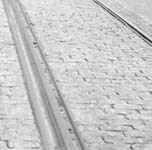 In each case, standard gauge track was constructed on streets that didn't already have streetcar tracks. Except, there were a few points where sharing the street was unavoidable and dual gauge track was installed. The CRP&L did eventually operate one of those standard gauge interurban lines. It was the standard gauge Steelton-Summit streetcar line giving Columbus a two gauge system. * From Innis to Barthman only the northbound track was dual gauge. Wide Gauge - 5' 2"
All other tracks were wide gauge. There was a Pennsylvania Railroad siding and some dual gauge track at the Grandview Material Yard.